We are the Sisters of St. Joseph the Worker, a community of consecrated religious nuns in the Catholic Church. We are located in St. Joseph, Antique, Panay Island, in the Philippines. Following Jesus the Good Shepherd, we seek out the poor, victims of calamities, and special children – orphans, the disabled, abandoned, marginalized, abused, indigent, homeless, to bring to them, above all, the knowledge that God loves them no matter how lowly they may appear to society. With our Founder St. Joseph the Worker, the saint of Divine Providence, we are dedicated to provide spiritual care and the basic necessities of food, clothing, shelter, medical care and other basic necessities of life to these poor children and their families. We also help facilitate the development of healthy, vibrant and self-sustaining communities by addressing issues of education especially for poor and indigent children, providing food, security, potable water, employment, community health, and promote disaster-emergency projects. In all we do we try to exemplify compassion and benevolence while conforming to the highest standards of integrity. We also provide short-term relief and development assistance to economically disadvantaged people and victims of disaster especially in this area. We focus on providing immediate need in form of food, clothing and other material assistance to remote and poorest area and rural families facing financial hardship by rallying people here and abroad to offer assistance in areas of immediate need . We are a non-profit corporation and we operate for charitable purposes only. We are the intermediary between our donors and the people these donors seek to help. provide inexpensive, even free, health care through setting up clinics, dispensaries and awareness outreach programs in villages beyond the reach of Doctors. build self-supporting educational programs and help sustain existing educational programs to provide quality, value-based education for children. protect our natural resources by creating innovative sustainable solutions that promote the responsible use of the earth’s ecosystems and resources by training farmers. empower underprivileged girls and boys with education and skills to raise sound families and in turn strengthen and stabilize their local communities. invest in the future of needy children and youths by inspiring learning, self-reliance, family respect, social responsibility, and moral integrity. assist and advance the most deprived members of our society living in tribal areas with access to basic health care, education, and social and economic amenities. provide immediate relief support to survivors of natural typhoon disasters and remain in service until the affected communities are rehabilitated and self-reliant. It all started in the humble heart of Sr. Concordia Villaram, way back in 1970. The situation in the Philippines was turbulent politically, economically and socially. People suffered injustice and all sorts of oppression and poverty. Gaps between the rich and the poor got wider and wider. It was in this situation that Sr. Concordia felt strongly the call to serve the poorest of the poor, to bring the Gospel message to them in prayer, life and action. 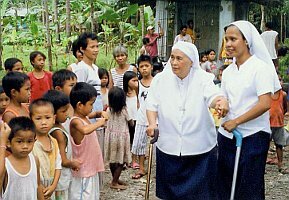 In 1986, she started helping the poor in Mindanao. One day, she went to visit her ailing mother. That was where she met Governor Evelio Javier of Antique who told her that the people of Antique would need more of her help than the people in Mindanao. 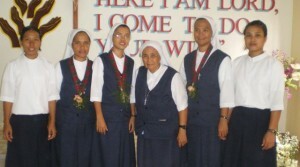 Hence, the birth of the Missionary Sisters of St. Joseph the Worker in Antique. Over the years, many people became aware of the work of these sisters. Some came forward to offer volunteer services, others provided financial support through any means that they could afford. Soon, some of the most active supporters formed a legal body to provide a more effective, coordinated, regular stream of support and to increase the number of regular donors. Two years later, in March 1988 in Antique, the St. Joseph Orphanage And Rehabilitation Center for Handicapped Inc. was formed and incorporated. This has been managed by the Sisters of St. Joseph the Worker ever since. What have we done, so far…. We have been concentrating our efforts in caring for the children in the most needy areas of the Philippines, more particularly in the most depressed provinces of Panay Island. Our focus have primarily been providing care and support to St. Joseph Orphanage in Maybato, San Jose, Antique, and providing food, shelter, education and other basic necessities to the people in this region. Our work has also expanded to different towns in Antique. Below is a list of our projects. Established a Pre-School for Indigent Children. 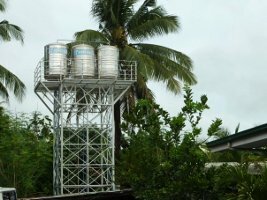 Installed a Potable Water well for fishermen’s villages. Built a decent Orphanage with occupying capacity for 50 Orphans and the disabled. Helped provide low-cost houses for the people rendered homeless by cyclone Frank. Established a Program for 1500 indigent mountain children for basic educational scholarship. Rehabilitated 350 handicapped children from 1998 to 2009 (average of 12 Handicapped served per year). Established Livelihood projects for parents of handicapped children (1 dozen chicken & a couple of pig for each family). Provided Distant adoption of poor and orphans and street children. Participated in the relief operations for victims of natural disaster and calamities. Provided Rehabilitation of homeless street children. Our long-term project goal is to construct a total of 50 homes for the homeless and victims of typhoons at a current cost of €5,000 each family. Three rooms and one kitchenette. Each house has sanitary facility and a livelihood project. Funding for all or part of these houses will be greatly appreciated. A small hospital ward equipment for treatment of children with actual cost of Euro 30,000. 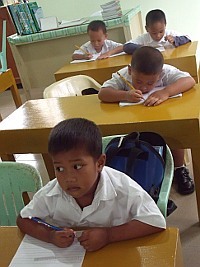 10 Handicapped children waiting for surgical rehabilitation costing P60,000 Pesos each. For many years, we have received helps in various forms from many people. Some provided volunteer services, like teachers, engineers. Some volunteers are from the orphans or the disabled themselves, who have grown up and become self-reliant through the care of the Orphanage/Rehab Center. Many have donated in kinds (food, clothing, medical necessities, etc). Besides that, we have also received help from international funding agencies like the Liliane Foundation which have helped financed the education, medical assistance for the disables. One thing is certain: that every dollar or euro or penny donated has been put to effective and good use. We ask you to join us in this VENTURE in doing something good and beautiful for God and for God’s poor people. Pray for the destitute, the poor, the abandoned and for those who are making efforts in the front line helping people in need and alleviate their sufferings. Contribute your time, talents or treasure whichever possible. Give regular donations, in kind or in cash, to support the day-to-day operations at the orphanage, schools, clinics and a home for homeless children. Give special donation, in kind, in cash, or in check to support specific major projects. Please CONTACT US, or better still VISIT US.